Another collaboration with Mariah Carey, this time an 18-piece collection for holiday 2013. This collection has a variety of finishes along with 6 liquid sand shades. Check out the swatches below! My Favorite Ornament 3 coats. Fine champagne glitter. In My Santa Suit 2 coats. Frosty red. 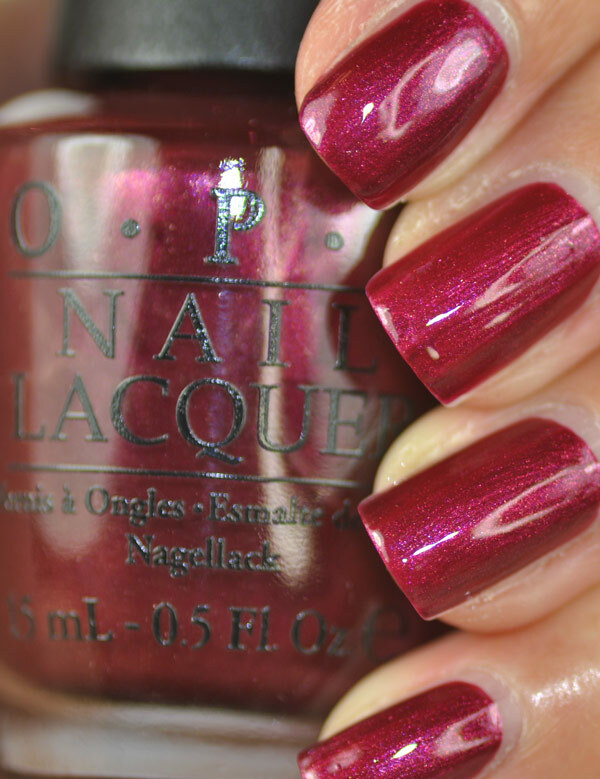 Cute Little Vixen 2 coats. Shimmery and frosty reddish violet. This one leaves brushstrokes so apply with care. Ski Slope Sweetie 3 coats. 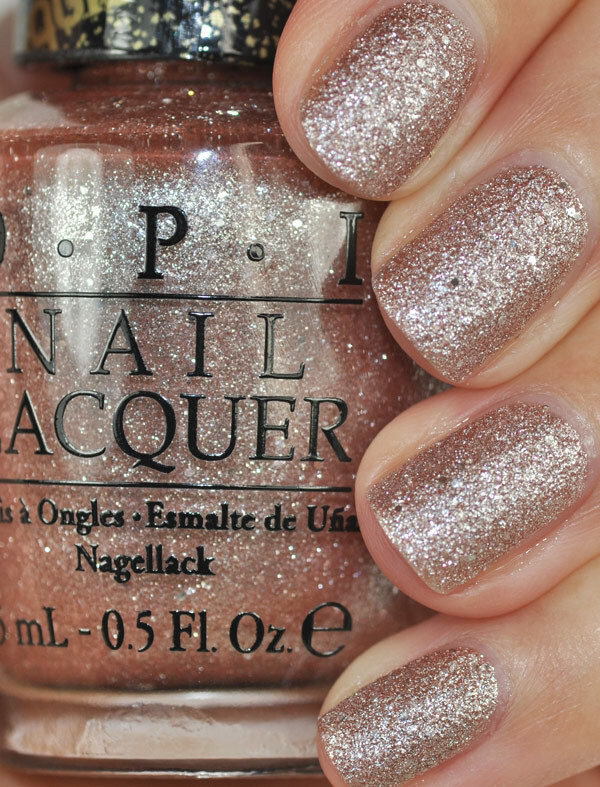 Very pretty pearly top coat that shimmers gold. 1 coat of Ski Slope Sweetie over All Sparkly and Gold. Wonderous Star 3 coats. 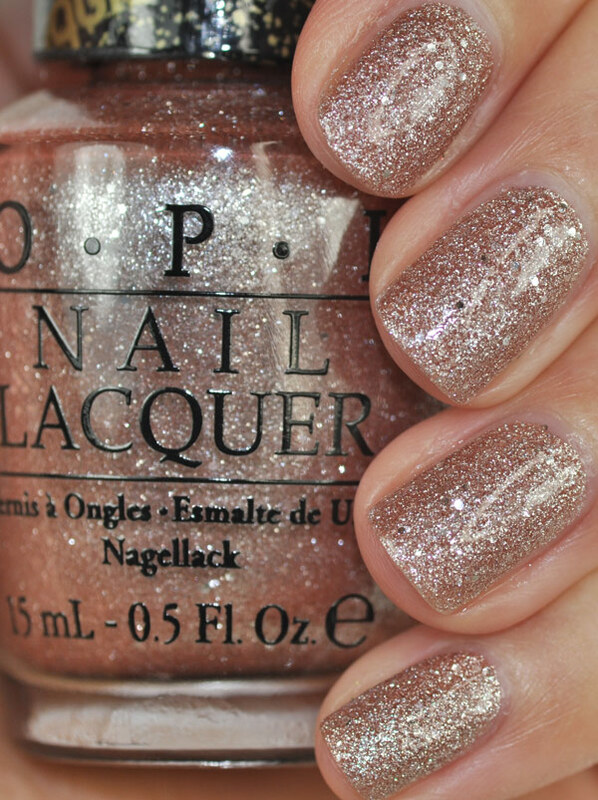 Opi describes it as gold-flecked but to me the gold is so light it looks silvery. I think this would be better layered and make an interesting accent nail. Underneath The Mistletoe 3 coats. Described as candy-apple red, my bottle looks very raspberry red. No matter how I photographed it. This has fine red and pink glitter. Slightly thicker formula than the rest of the collection but still easy to work with. All Sparkly And Gold 3 coats. Fine gold with some silver glitter. The base is interesting it is slightly darkened. If you wear this alone with 3 coats you don't really notice the base, but if you layer it over a lighter shade you may see it. All I want for Christmas 3 coats. This looks like a true red in certain lighting but in dimmer lighting I noticed it looked very dark. 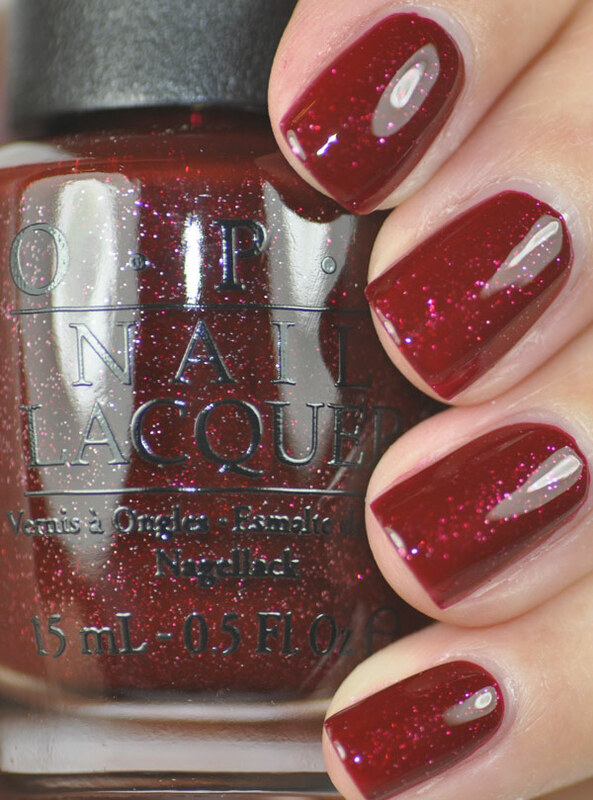 Visions of Love 3 coats. You may be able to wear 2 coats but I needed a third because my ridges were showing. Sleigh Ride For Two 2 coats. 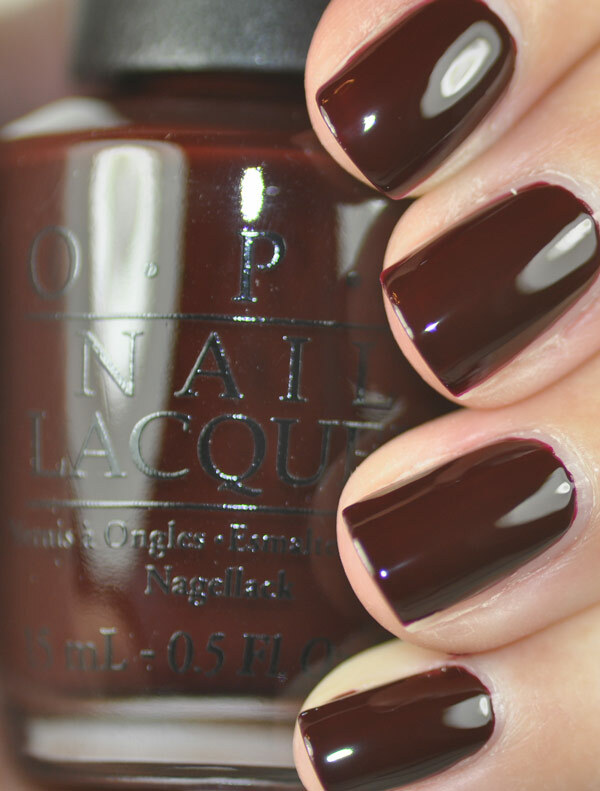 OPI describes this as "dark hot chocolate". I just don't see it. It looks burgundy to me. Maybe, just maybe in dimmer lighting it could pass for dark hot chocolate. 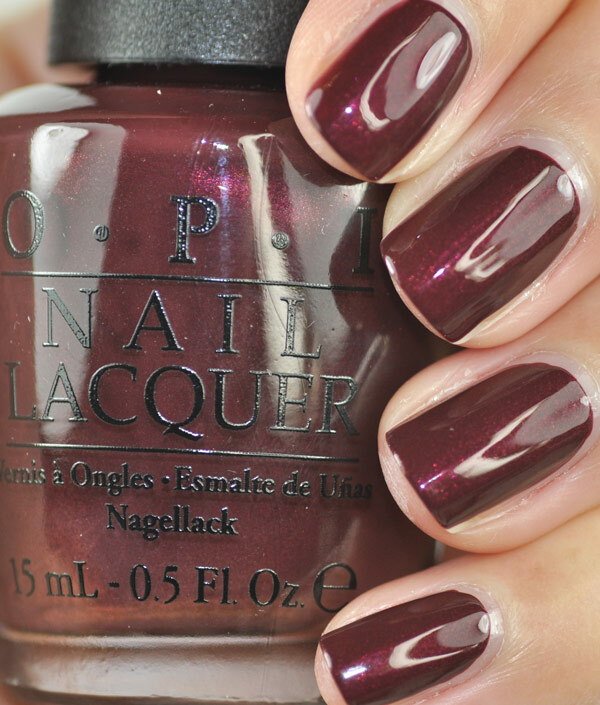 I Snow You Love Me 1 coat over Sleigh Ride For Two. The glitter is heavy so a good shaking will help with the fishing process. Even with shaking I was only getting 1 or 2 at most on my brush. I would instead of trying to brush on the glitter, to take the a toothpick or cuticle stick and placing the glitter where you want it. 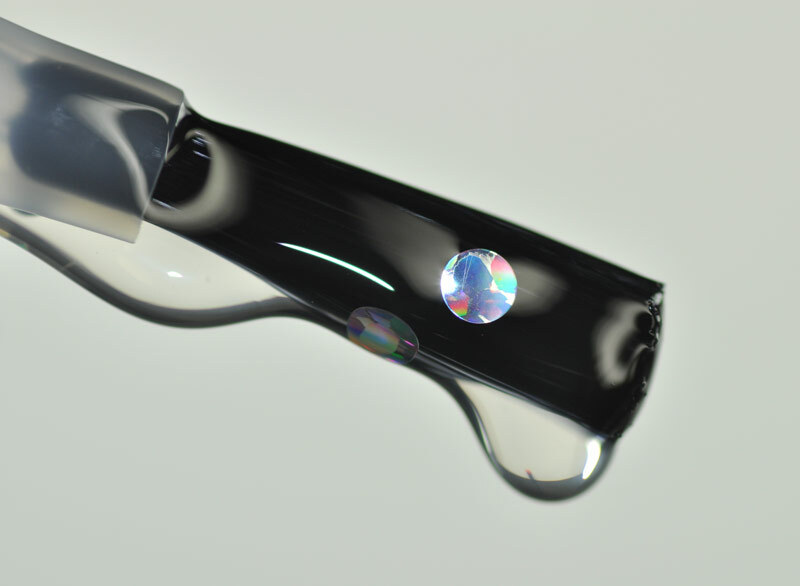 This also prevents bubbles from dabbing so much with the brush. So much base, so little glitter. Warm Me Up 3 coats. Frosty brown. Kiss Me At Midnight 2 coats. Personally not a fan of this color blue, especially textured. Silent Stars Go By 3 coats. Pale blush pink. Love this one. It's Frosty Outside 3 coats. Foily looking silver with silver hex glitter. 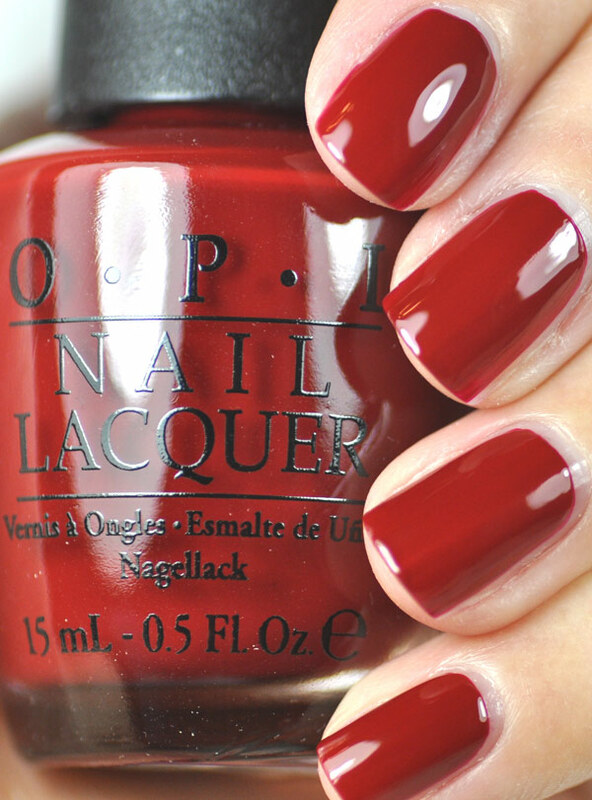 Can't find the top coat photo, oops. Emotions 1 coat. I just wanted to show what this glitter looked like. 3 coats. Textured black with different sized black hex glitter. After 3 coats you really can't see much of anything but the texture. This is nothing like Funky Chunky by Deborah Lippmann in terms of the texture but similar in a way because it's kind of out there. This is 1 coat of Seche Vite, applied generously. Clearly this one should be worn textured or not at all. Baby Please Come Home 3 coats. Pale purple. Make Him Mine 3 coats. This reminds me of rose gold jewelry. With the exception of Kiss Me At Midnight and Emotions for the, I loved all of the other 4 textured shades. The Liquid Sand colors always are such a breeze to apply and dry quickly. For the rest of the collection, my favorites were Wonderous Star and My Favorite Ornament. I really wanted to like I Snow You Love Me because I thought the glitter is really pretty but there just wasn't enough of it in my bottle. 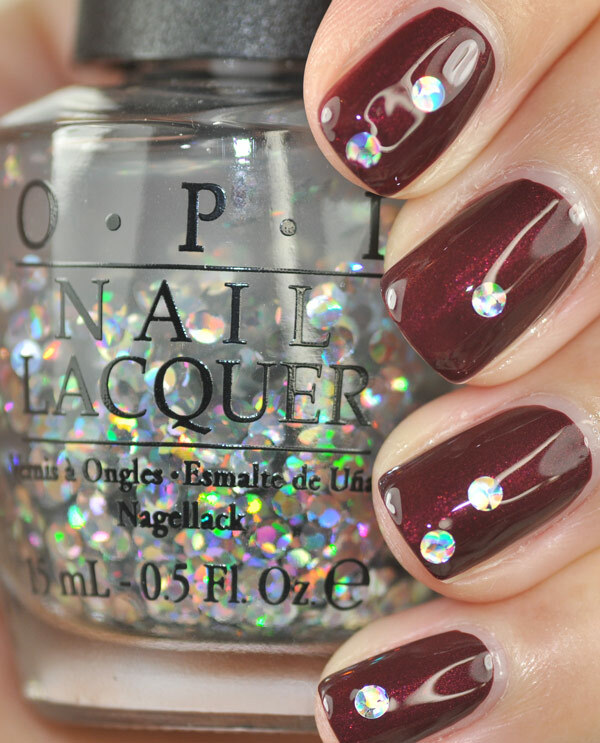 These are available for $9.00 wherever OPI is sold.